Rich Hand Cream and Foot Ointment set. Save £4 by buying a set. The best natural skin care, you and your family can enjoy every day. Nourishing your hands to help them stay soft. Massage the cream onto your hands before going to bed for skin rejuvenation. 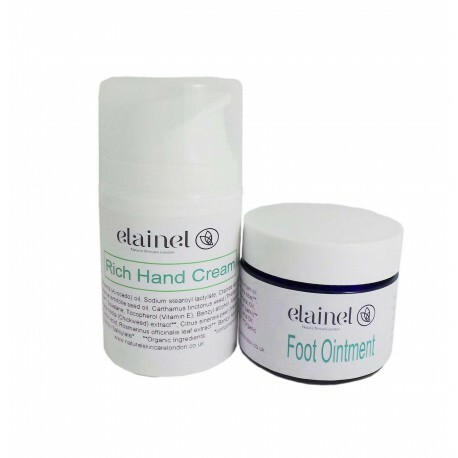 Foot Ointment nourishes dry foot. Organic Shea butter: Superfood for your skin. Myrrha : A great antioxidant, sooth chapped skin. Massage into hands morning and night. Perfect for use throughout the day when your hands needs moisturiser. Apply small amount on clean foot and message morning and night. Aqua, Urea, Persea gratissima (Avocado) oil, Sodium stearoyl lactylate, Crambe abyssinica seed oil**, Simmondsia chinensis seed (Jojoba) oil, Glyceryl stearate, Macadamia ternifolia seed oil, Carthamus tinctorius seed (Thistle) oil**, Cetearyl alcohol, Helianthus annuus (Sunflower) seed oil**, Cocos nucifera seed butter**, Squalane, Tocopherol (Vitamin E), Benzyl alcohol, Allantoin, Pelargonium graveolens leaf (Rose geranium) oil**, Lavandula angustifolia oil, Stellaria media (Chickweed) extract**, Citrus sinensis peel (orange) oil expressed**, Salicylic acid, Cananga odorata flower (Ylang Ylang) oil**, Glycerin, Sorbic acid, Rosmarinus officinalis leaf extract**, Benzyl Alcohol *,d-Limonene*, Citronellol*, Linalol*, Geraniol*, Citral*, Benzyl Benzoate*,Farnesol*, Benzyl Salicylate*. Coconut oil (Caprylic/Capric Triglyceride), Meadowfoam oil (Limnanthes slba), Grapeseed oil (Vitis vinifera), Beeswax(Cera Alba)**, Jojoba oil (Simmondsia chinensis), Apricot Kernel (Prunus armeniaca) Oil, Cocobutter (Theobroma Cacao)**, Shea Butter (Butyrospermum parkii)**, Macadamia Nut (Macadamia tetraphylla) Oil, Commiphora myrrha Oil, Lavandula angustifolia Oil, Linalool*, D-Limonene*, Geraniol*. **Organic ingredients, *component of natural essential oils. *Free delivery available when you spend £20 or more (excluding delivery charge) through naturalskincarelondon.co.uk online. Standard delivery is for Channel Islands, Isle of Man, Europe, USA and Canada and applies to your entire order. Place your order before noon Monday to Thursday, your order will arrive next working day. Excluding Saturday and Sunday. Place your order before noon on Friday and will arrive the following Monday, excluding Bank holiday. Next Day Service is unavailable for the Scottish highlands, Northern Ireland or any UK Islands. © 2019 Natural Skincare London Limited. All rights reserved.